FireBall sets are a contemporary, modern alternative to traditional gas logs. - Multiple diameters & sizes of Spheres made from the same high-heat refractory concrete as our gas logs. - Choice of colors - "Natural" is the tannish gray of the base material. The other colors are our proprietary ceramic stain coloration. We recommend darker colors (Black, Dark Gray, & Brown) as the burner will create soot from the natural, luminous yellow flame. The black soot is more noticeable against the lighter colors (Natural, Adobe Red, Beige, & Light Gray); with the darker colors there is less contrast, so the soot is not as pronounced. 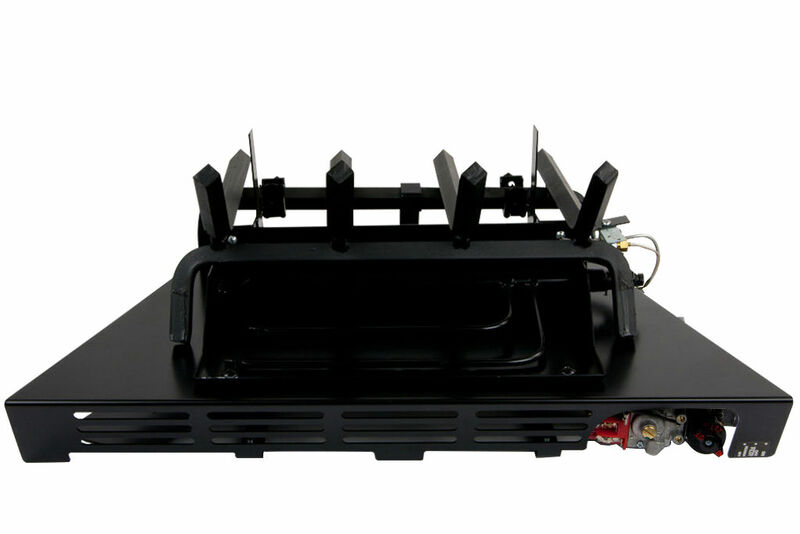 - The rectangular Custom Pan Burner is made from substantial 16 gauge cold roll steel, fully welded seams, and painted with black enamel paint. It has strap legs that may be installed for a clean, contemporary look, or installed without the legs (close the holes in the bottom of the pan with the bolts/washers/nuts) flush of the floor, then rim around the burner with Volcanic Ash to create a "pit" look. - Select Natural Gas or Propane. 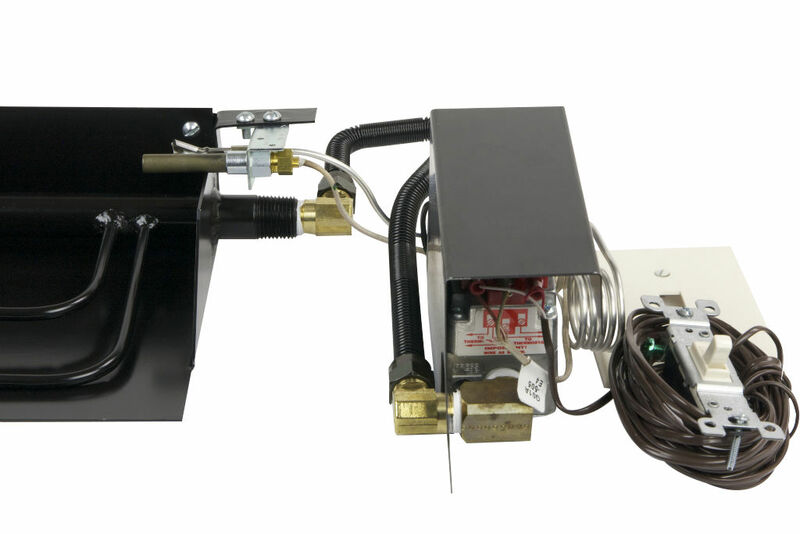 There are many methods for controlling the gas flow to a vented gas log burner. (All photos are shown with Flaming Ember XTRA Burner, but can be used with any vented pan burner. All Valve Vanishers are factory assembled. All others can be ordered as factory assembled or as kits. Match Lighted. Only for Natural Gas (see reasoning below). Light a match, place on ember bed, turn on gas with log lighter valve (usually in the wall or floor outside of the fireplace, but can use valve installed at the burner, like the V17B). Match Lighted. Shown with V17B manual valve. Safety Lighting Controls [SLC]. SLC stop the gas flow to the burner(s) in the event of an interruption in the gas supply or a flameout, so that raw gas will not continue to flow. Propane is heavier than air, so it accumulates rather than vents up a chimney, like Natural Gas does. Accumulated Propane is an explosion hazard, so the use of a SLC prevents this. 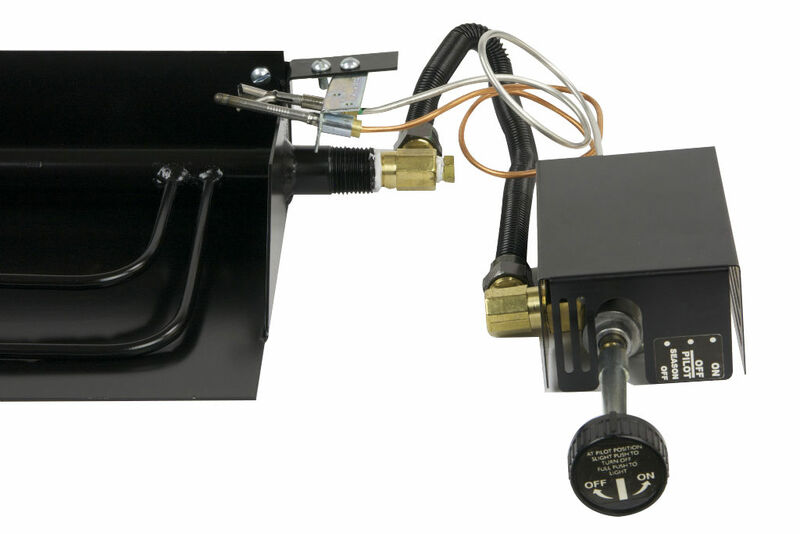 Therefore, all Propane sets must have a Safety Lighting Control that automatically shuts down the flow of gas. SLC also provide a convenient means of lighting the main burner(s) and, in some units, controlling the flame height. They are required for all propane installations, advisable for natural gas, and are required for installations in certain jurisdictions. Basic Manual Safety Pilot Control [SPK1] – turn the valve knob to light the main burner and adjust the flame height. Is not upgradable to remote control. 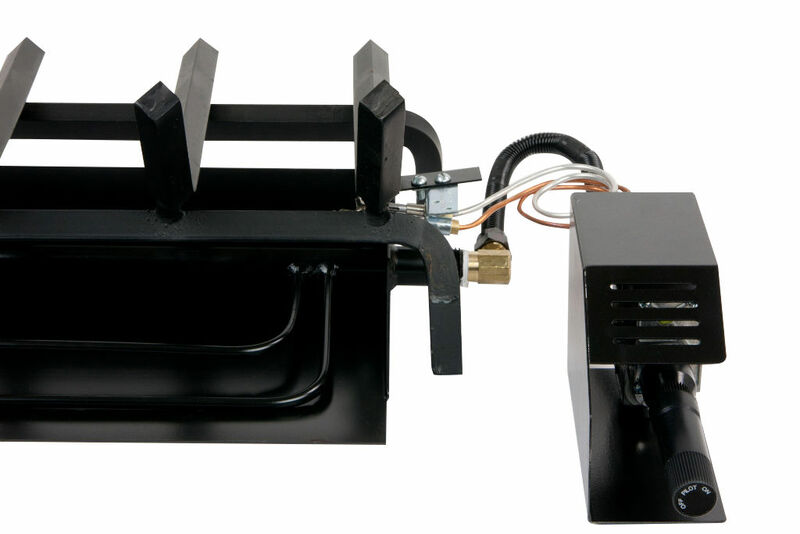 Has 150,000 BTU/hour capacity (up to 42" set size). Available as On-The-Side or Underneath (in Valve Vanisher). SPK1 Manual Safety Pilot Control. ***Please note: All of the below "EASY" options use the same valve body. 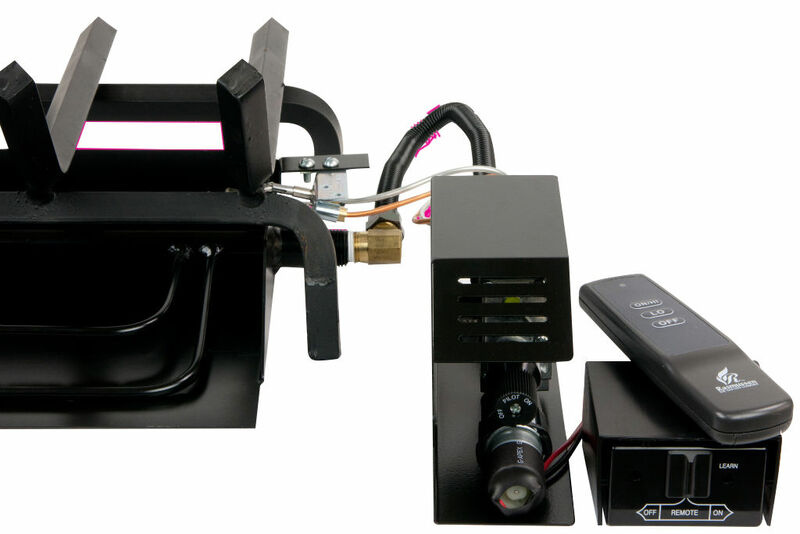 This means that a "Manual" kit may be upgraded at any time to either "Remote Ready" or "Variable Flame Height Remote Control" functionality with the addition of either the SE-UP1 or RE-UP1 upgrade kits. 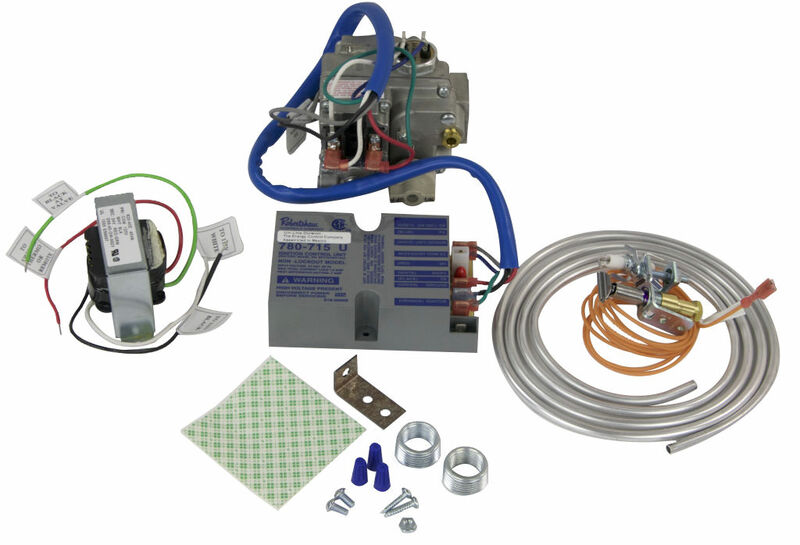 The all use a thermocouple pilot system. A) Manual Safety Pilot Control [SPK3E] – turn the valve knob to light the main burner. 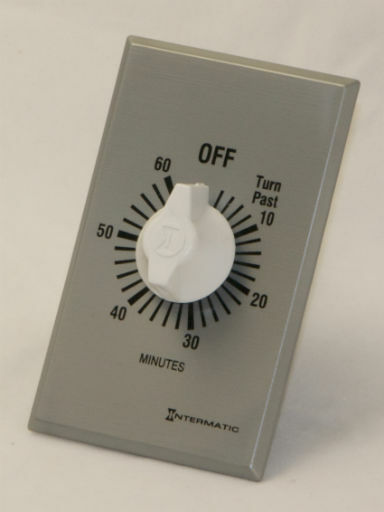 ON/OFF control (minimal flame height adjustment). Above: SPK3E Manual “EASY” Safety Pilot Control. 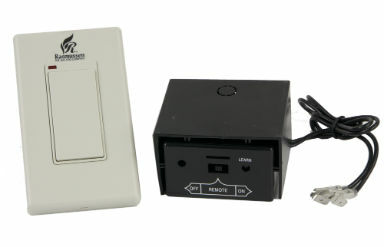 B) Remote Ready Safety Pilot [RPK3E] – Latching solenoid system that controls the ON/OFF of the burner(s) with the receiver switch or one of five Wireless Remote Transmitter Devices (sold separately – see below). "SE" is not a "millivolt" system. Minimal flame height adjustment with the knob at the valve. Above: RPK3E Remote Ready Safety Pilot. 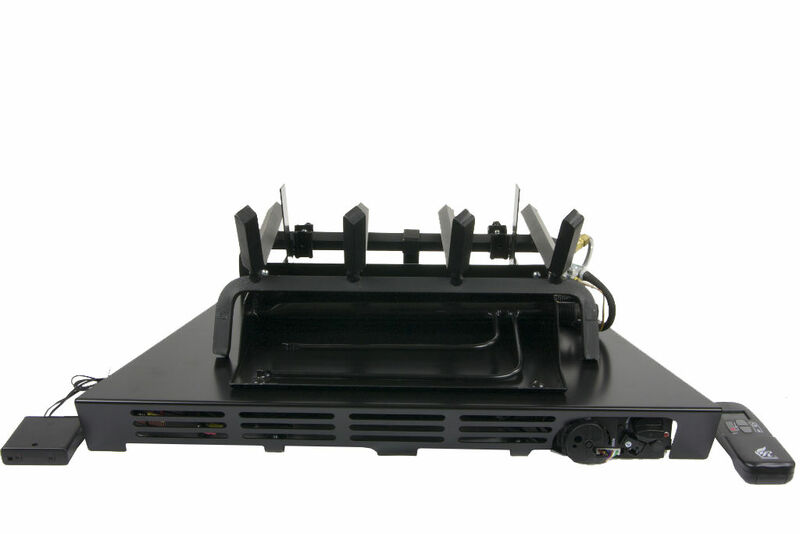 Operate with switch at receiver or with choice of five accessory transmitters. 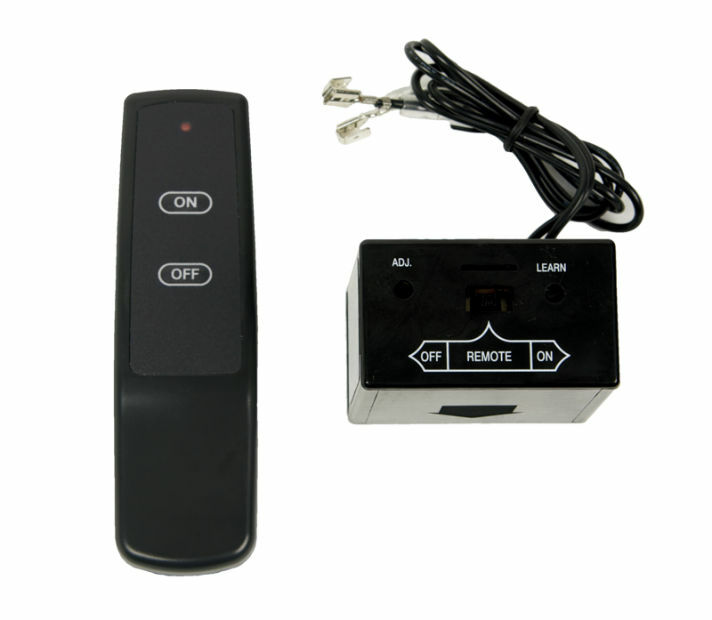 C) Variable Flame Height Remote Safety Control [RMC1E] – Light the burner and control the flame height with the hand-held wireless remote control (included). 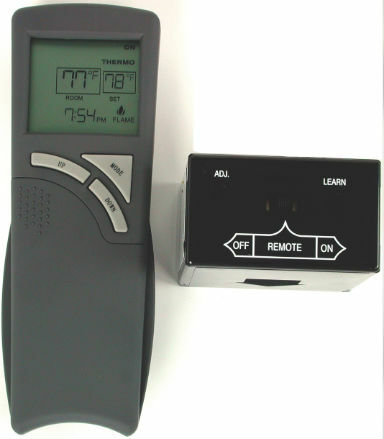 Above: RMC1E Variable Flame Height Remote Safety Pilot Control (includes remote transmitter). RPK3 for 30” and smaller; 24” for see-through. Available as On-The-Side or Underneath (in Valve Vanisher). RPK1 for 33” to 48”; 30” to 36” for see-through. RPK1HC for 54” to 60”; 42” to 48” for see-through. RPK1XHC for 72” and larger; 60” and larger for see-through. Light the burner with the included wired wall switch, or with the below accessories. Adjust the flame height manually by adjusting the knob at the valve. Above: VMV Millivolt Safety Pilot Control in Valve Vanisher assembly. Above: RPK3 Millivolt Safety Pilot Control - for 30" and smaller set sizes. Shown with wired wall switch. Can also be used with a variety of wireless options. Above: RPK1 Millivolt Safety Pilot Control - for 33" and larger set sizes. Shown with wired wall switch. Can also be used with a variety of wireless options. 3) Outside, but adjacent to, the firebox. On the Side of the set Inside the firebox [EIS-RS150]. The “Big Ugly Box” – 4.25”w x 8” d x 5” h. For 30” and smaller set sizes. ON, OFF and Flame Height controlled by hand-held remote transmitter (included). 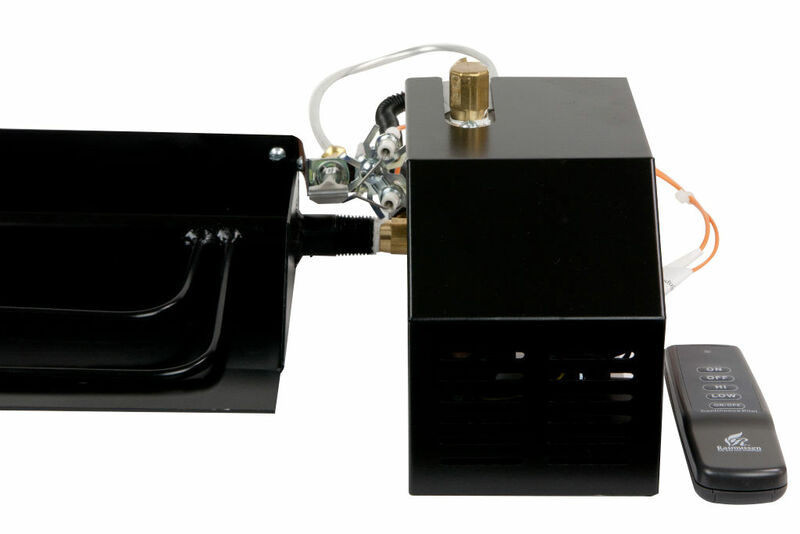 Battery powered or 120v with accessory [STEV-AC]. 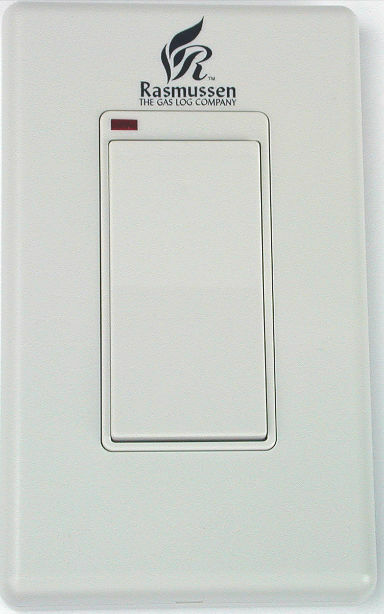 Can be interfaced with home automation system or wall switch (loses flame height adjustment), but not with power vent. 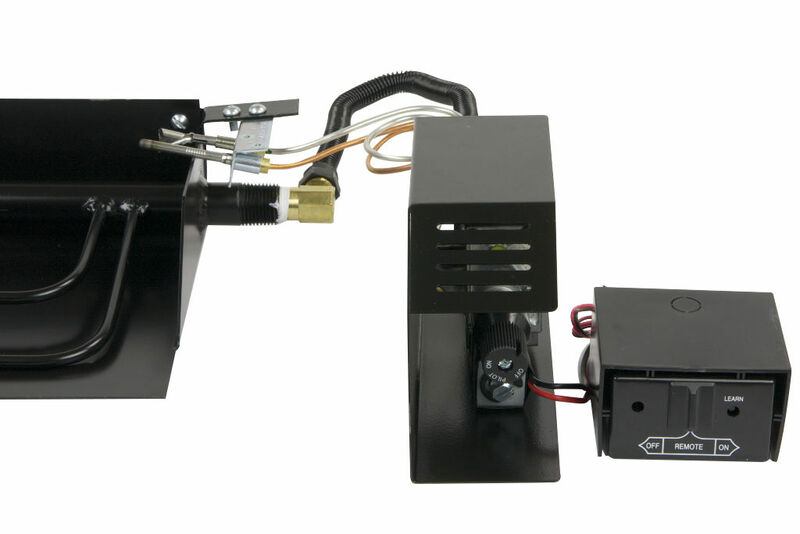 EIS-RS150 Electronic Ignition System with Variable Flame Height Remote Control. Outside, but adjacent to, the firebox, with the components installed outside of the firebox in a "vault" (minimum 12” x 12” x 12” ) with gas and electricity. RL150 – 120v and/or battery powered. For 30” and smaller set sizes. ON, OFF and Flame Height controlled by hand-held remote transmitter (included). 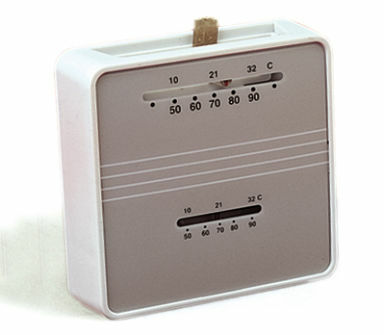 Battery powered or 120v with accessory [STEV-AC]. 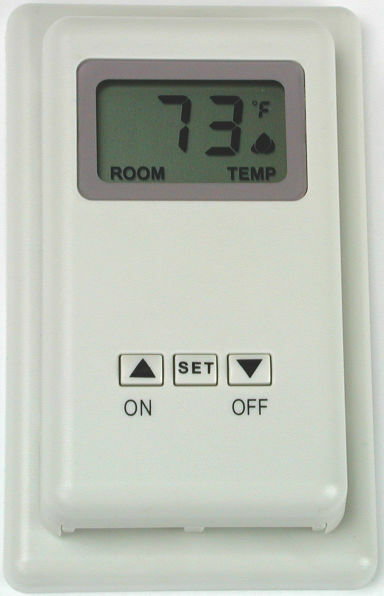 Can be interfaced with home automation system or wall switch (loses flame height adjustment), but not with power vent. 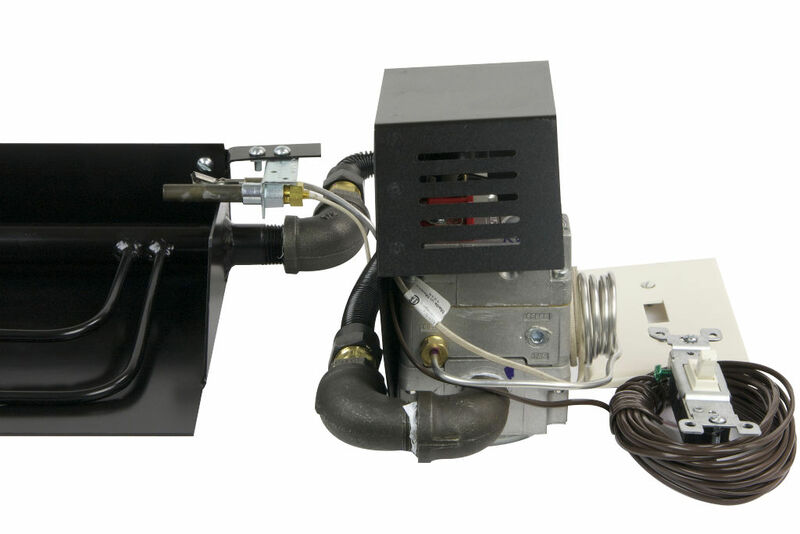 Note: Same components as EIS-RS150 except with 72-inch igniter leads and pilot tube. 120V AC Powered. Versions for all sizes. ON/OFF control only. 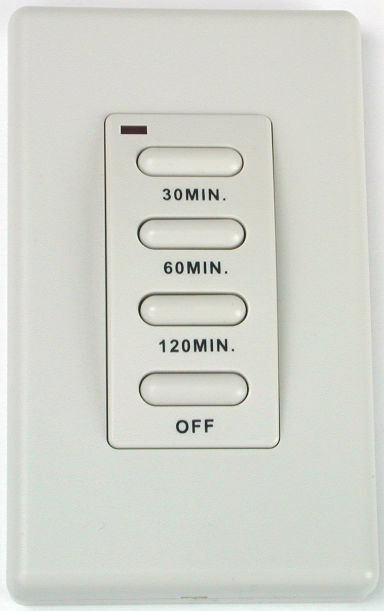 Can be interfaced with remote control, home automation system, power vent and/or wall switch. 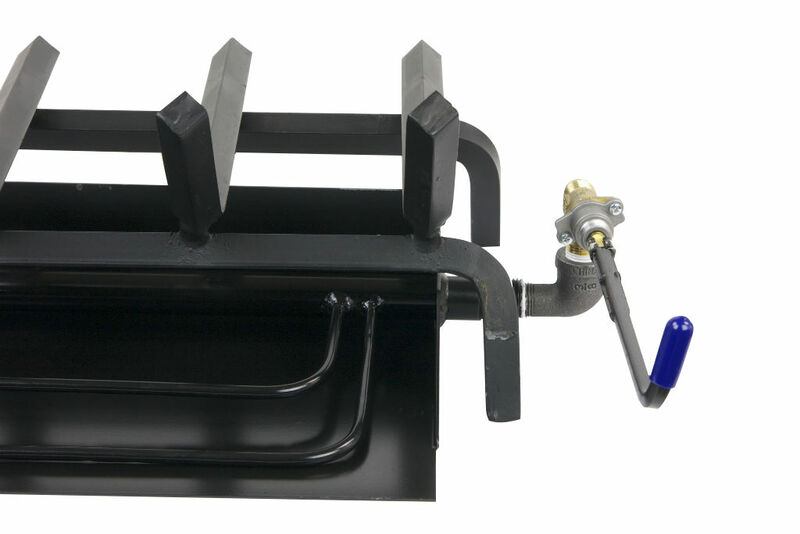 No gas modulation control – requires manual valve at burner to control flame height (such as V17, V1, or V2, or one of sufficient gas capacity). ). 120v stepped down to 24v with included transformer. Above: Basic components of 120v Powered EIS. Click the button below to add the BALL30-A Mixed FireBall Set Creator - CS30 to your wish list.